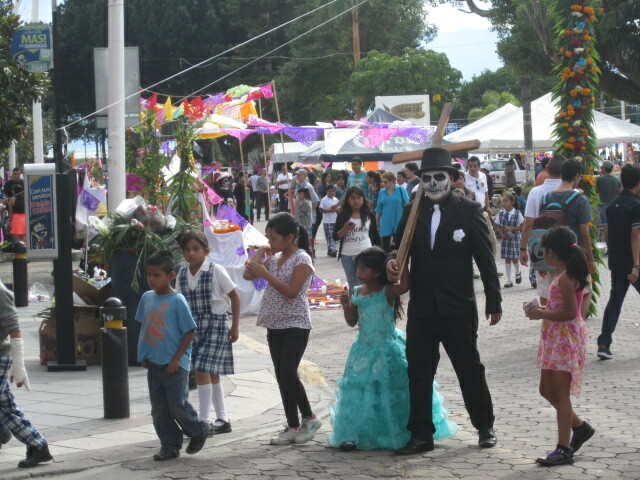 The Day of the Dead is a big Holiday in Mexico. 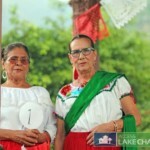 Some people say that Mexicans don’t celebrate Halloween. Tell that to the little girl in the photo below. She was all ready to go trick or treating in the evening. Just like in the United States, parents take their children out trick or treating to the expensive neighborhoods. I bought enough candy for a hundred children. Only five children knocked on my door. The same ones kept returning. I live in a Mexican neighborhood with small homes. 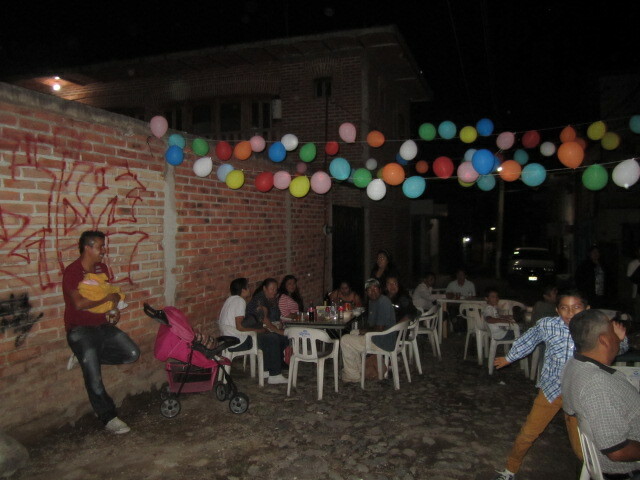 What they did in my street is to close it off to traffic, string up balloons and put out tables and chairs and have a party for everyone living on the street. My friend and I took out all our candy and gave it to the children. 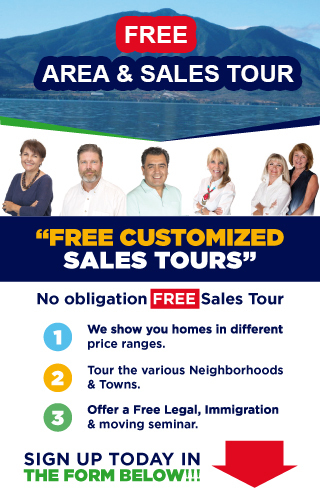 After we went back home, two young men knocked on my door and handed us two bowls of pazole. 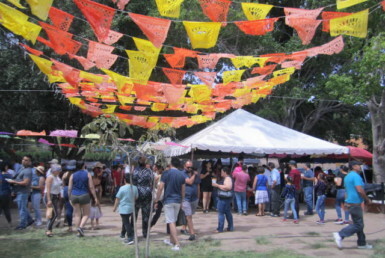 The Ajijic Plaza had things going on all weekend. 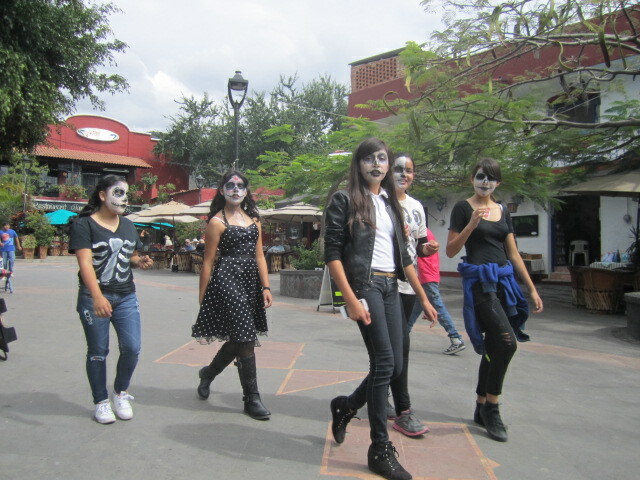 Lots of people walked around with faces painted like skulls. There was dancing. 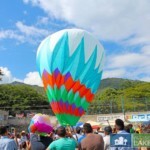 People were enjoying the excitement of the holiday. 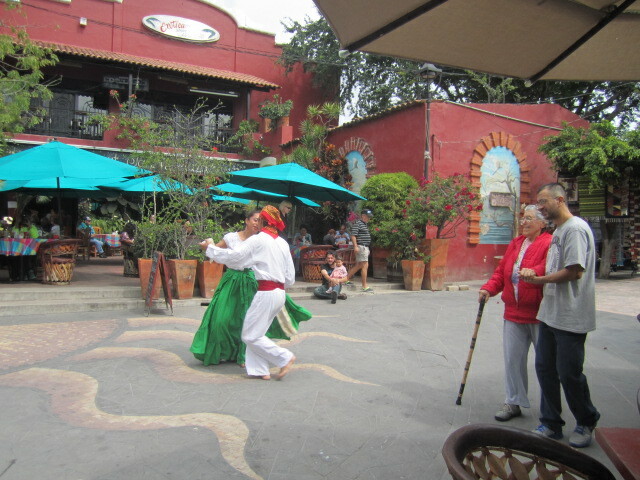 Young and old people enjoyed all the activities. 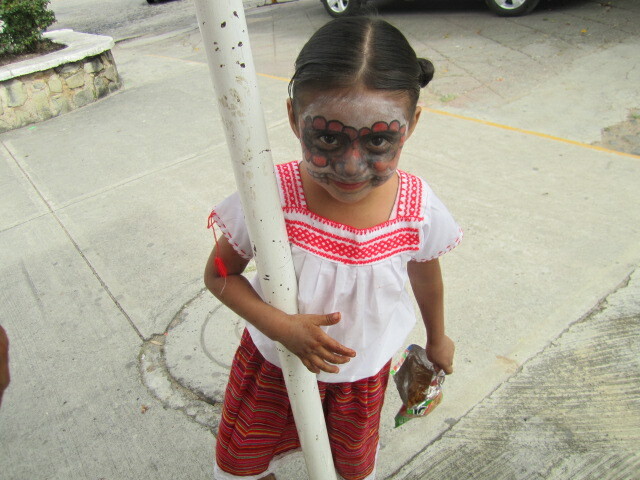 I liked to watch the young girls roaming the plaza with their faces painted. 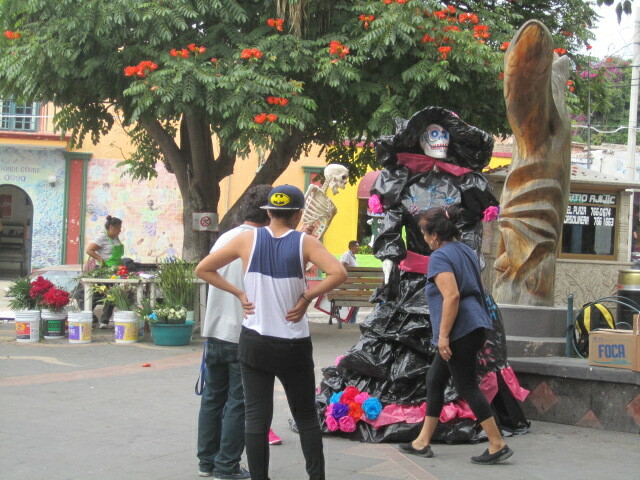 This year they did not put up Catrina dolls on the Ajijic Malecon but they did put one in the Ajijic plaza along with an altar. 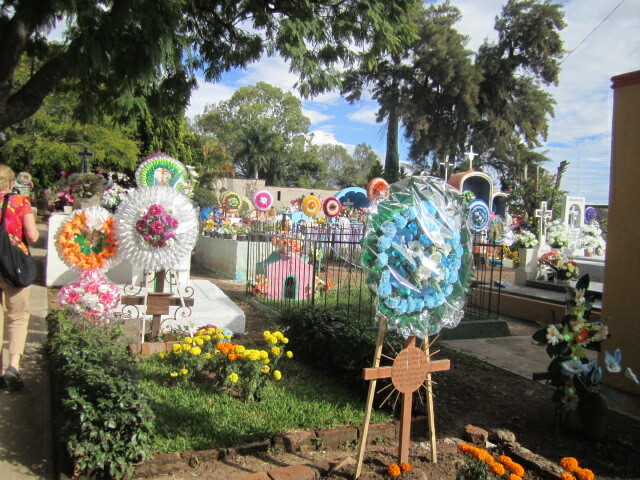 On November the first there were altars in Chapala for the children and babies who passed away and on the second they had altars for the adults. 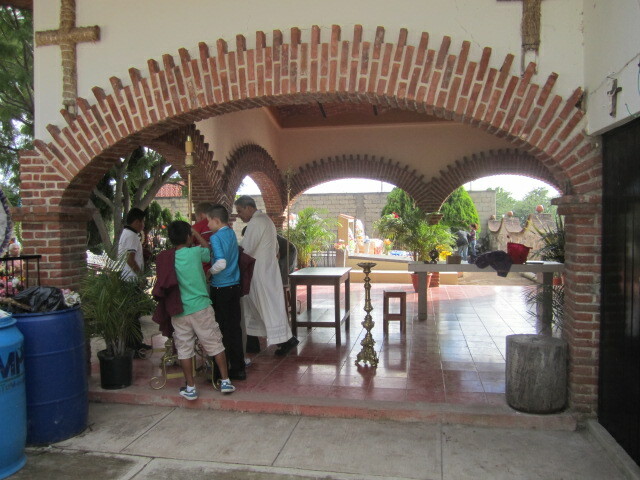 Many young people help to make the altars. It is a party atmosphere yet, for me, also a sense of sadness at the passing of so many loved ones from this world. 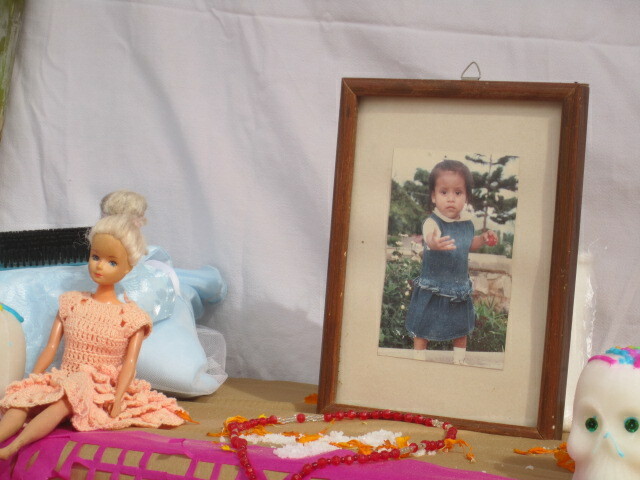 You can see in the above photo that her doll and necklace were on the altar. 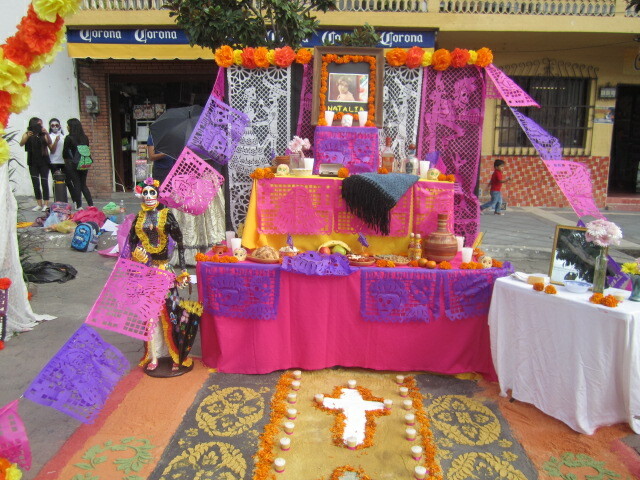 The altars also have their favorite food and clothes and sometimes a wash basin, soap, mirror and towel so the dead can wash up before eating their favorite food. 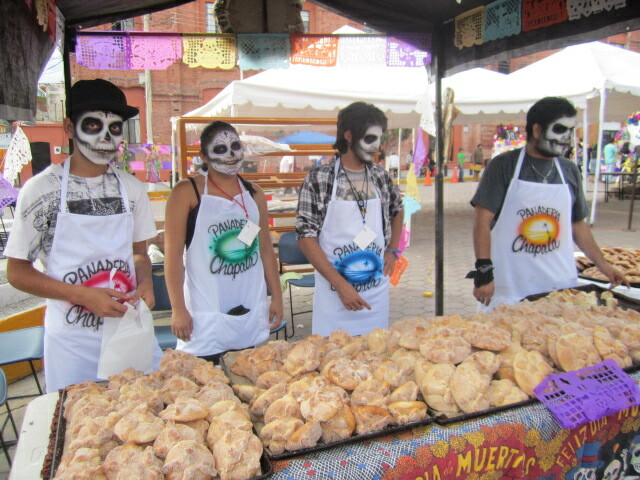 Young people in the above photo are selling a special bread that is only made during this time of the year. Most altars have it for the dead to eat when they return to visit. I bought one and it is delicious. 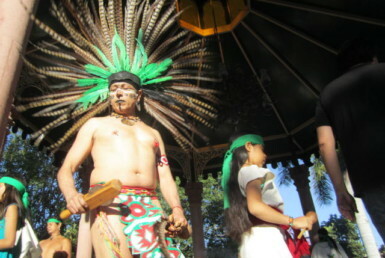 Many of the altars were made to honor famous Mexicans; writers, actors, musicians, Cowboys,etc. 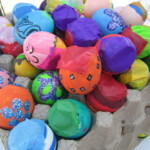 It is a good way for the young people who make the altars to learn about their cultural heritage. 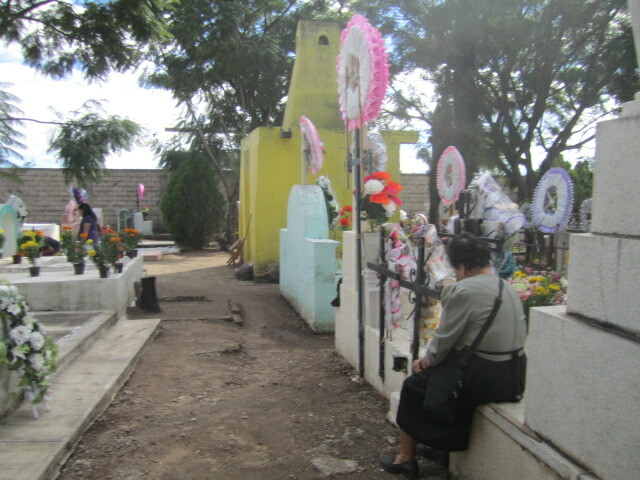 Many of the people who visited the blocks of altars wore costumes. There was a real festive atmosphere on the closed off streets. 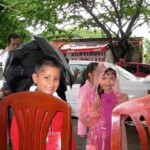 I spent most of one afternoon walking the closed off blocks in Chapala, enjoying all the energy of the young people. 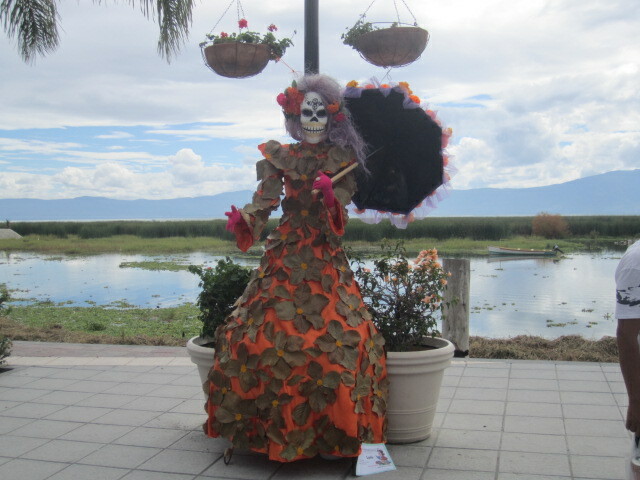 Then I took a walk along the Chapala malecon. I found only one Katrina there this year. She was made by one of the schools. Her name was Lulu. I found two more Catrinas on my way to my car. I always enjoy seeing them and all the creativity and work that goes into making them. 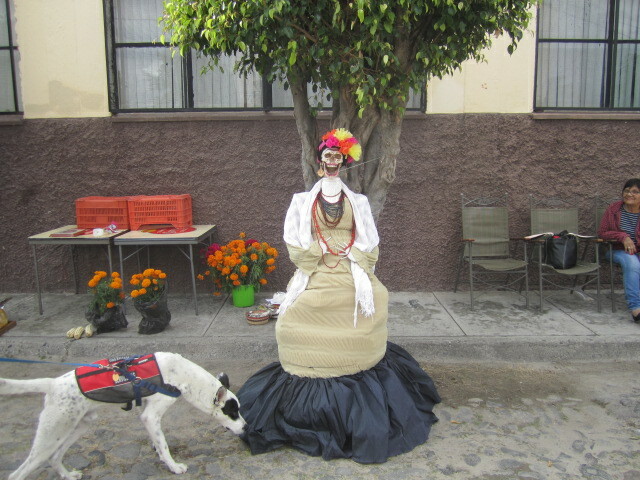 The dog that was with me enjoyed the Catrina in the photo below. The woman who made it seemed to like the attention her creation was getting. Next stop, the cemetery in San Antonio. I have never been to the cemeteries at night but I have heard that there is always a party atmosphere. 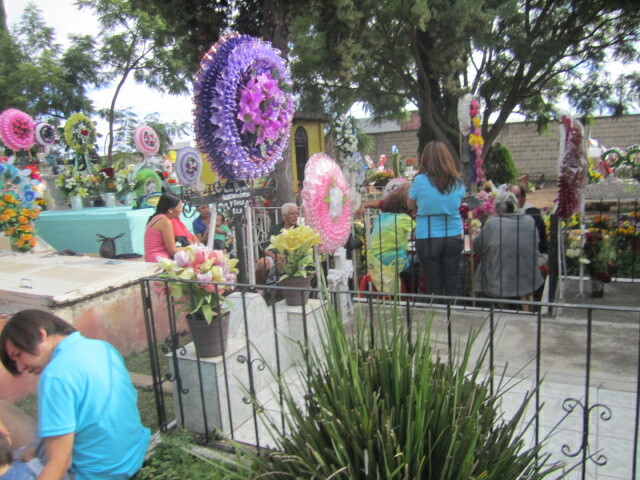 Families gather around the graves of their loved ones, eat, drink and listen to music. In the afternoons it is quieter and somber. Not many people were at the cemetery when I was there. 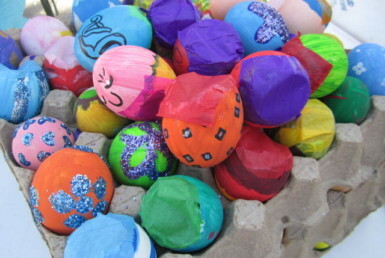 It was very peaceful after all the excitement in Chapala with the young people making altars. 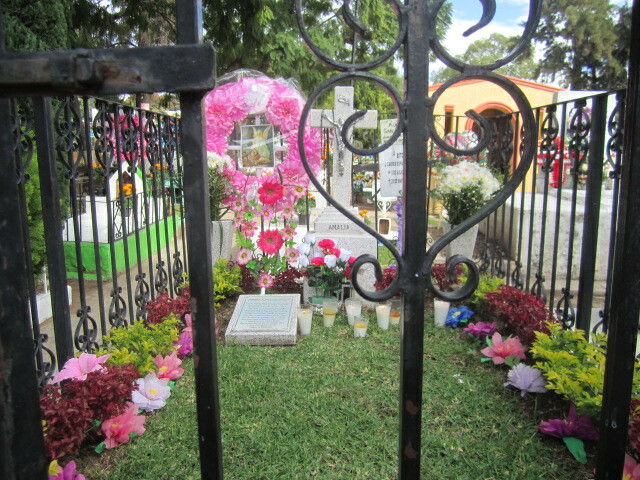 Almost all the graves had flowers on them, either fresh ones or artificial ones. As I was leaving the cemetery I saw the priest getting ready to have some sort of ceremony. Maybe to bless the living or the ones who have already passed over? 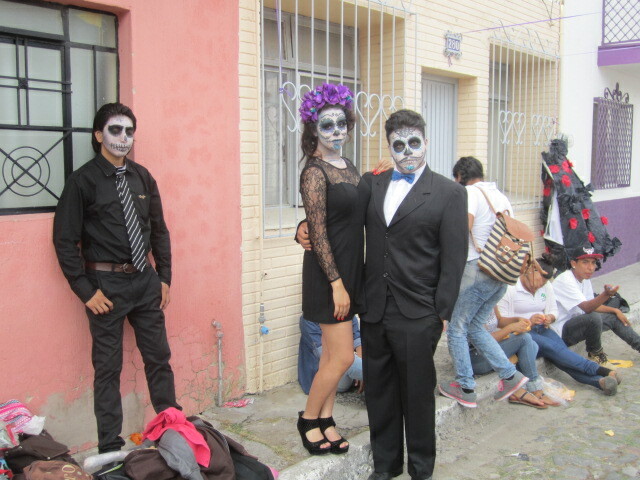 There is so much about the Day of the Dead that I do not know or understand. 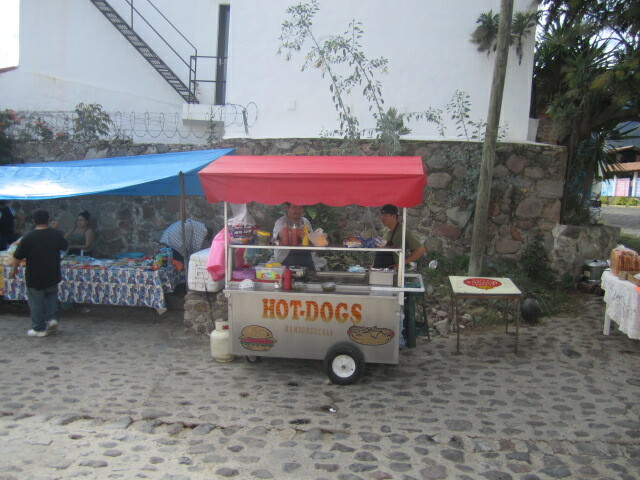 Outside of the cemetery gate there were food stands set up for the hungry living people. Hot dogs, my favorite food. If anyone makes me an altar after I die, I hope hot dogs will be on it. 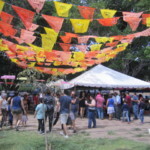 If you are thinking of visiting Mexico and you are wondering when is the best time, try the end of October and beginning of November. 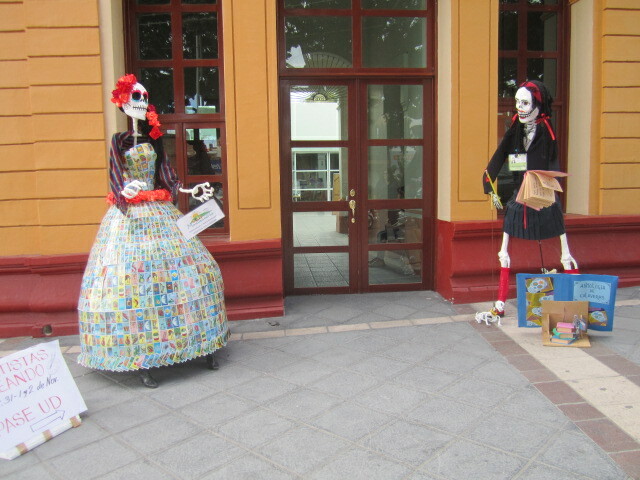 All over Mexico they celebrate the Day of the Dead and it is exciting. Always enjoy what you send out. Thank you. 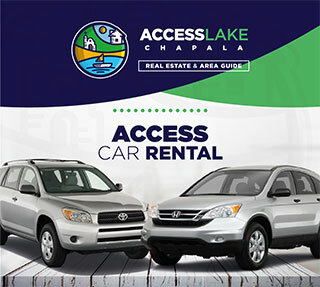 (Am thinking about moving there…..
Just retired and now looking to come to visit Lake Chapala and Ajiijic in March/April….in the meantime…I love reading your posts. My main worry is that I will be lonely………and when I see all the activities available all year round….I think things will be fine.